Speculation about the Apple Tablet mostly focuses on what the device is, not how it functions. Text input, more than anything else, is the problem Apple needs to solve to make the concept work. So how will they do it? CES was rotten with new tablets, some Android, some not, some with fascinating screens, and again, some not. But one thing they all had in common was that they hadn't quite figured out the text input problem: How do you create text without a keyboard? Extending this to the tablet, though, would be a mistake. I had a chance to play with a few different sizes of tablets at CES, nearly all of which had traditional onscreen keyboards—in particular, the Android 2.0 keyboard, which is aesthetically different but functionally almost identical to iPhone OSes. None of them worked, at least in the way that I wanted them to, for one reason: they were too big. Seven-inch tablets were too large to comfortably thumb-type on, while 10-inch tablets made text input all but impossible. The onscreen keyboard as we know it doesn't scale gracefully, and unless Apple wants their tablet to be completely useless (our sources say they don't) they're going to have to figure this out. So what are Apple's options? Apple has made mistakes before, but to only have a simple onscreen keyboard would qualify as an outright screw-up. 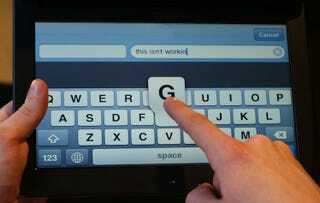 QWERTY-style, thumb-actuated onscreen keyboards work on screens up to about five inches, with the 4.3-inch-screened HTC Touch HD2's keyboard straining even the most unsettlingly long thumbs. But to assume that this won't work is to assume that the tablet is to be held a certain way, with hands at four and eight o-clock, more or less like a touchscreen phone in landscape mode. This may not be the case. What if the tablet is meant to be held with one hand, and controlled with the other? What if it has some kind of kickstand or mount, so you can actually type with both hands, a la a regular keyboard? What if it's intended to only work in portrait mode, where it would be just about narrow enough to be usable? Apple's filed extensive patents about how a large, multitouch onscreen keyboard might work, pictured above, but that doesn't necessarily mean anything: Apple's got more patents than the tablet's got rumors, and most of them never materialized into anything meaningful. 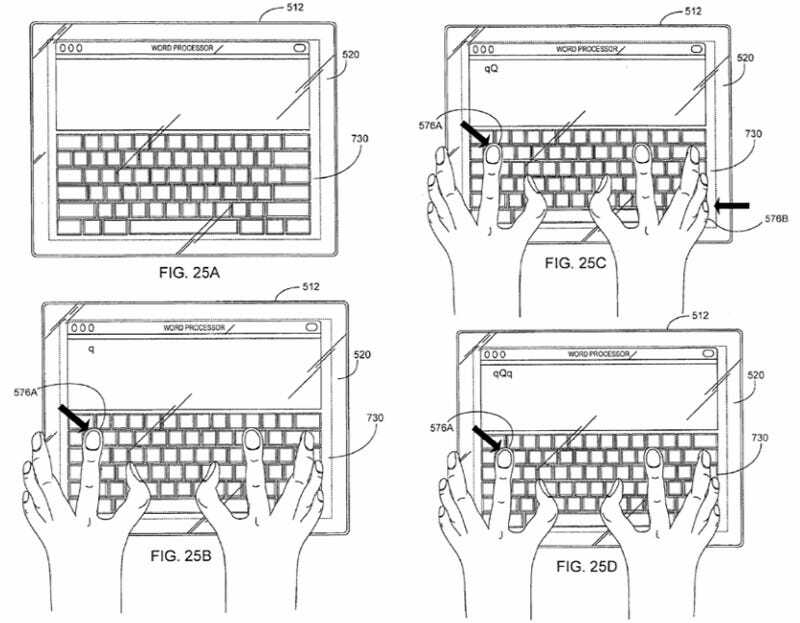 The keyboard patent, for example, also includes drawings of an onscreen clickwheel, and a description of how small interface elements, like the minimize/close/zoom buttons in OS X proper, could be handled on a touchscreen—all of which are terrible awkward, and dissonant with Apple's touchscreen philosophy so far. Either way, a single, iPhone-esque keyboard really shouldn't be the primary input method. It could be a supplementary input method, but to have two separate text input mechanisms seems messy, and distinctly un-Apple-y. Lame, half-baked input seems like the kind of thing Steve Jobs might fitfully shitcan a tablet for, actually, but that's getting awfully speculative, even for a piece about a product that doesn't officially exist at all. Apple's been on covert voice input crusade since it introduced Spoken Interface for OS X which, if you care to look (System Preferences>Speech>Speakable Items "On") is still there. As it stands, it's rudimentary—the iPhone's Voice Control speech recognition is much more accurate—and though there are quite a few customization options, it's really just a command system, not a full text input system. Even more developed technologies like Dragon Dictation are still niche products, and honestly, the concept of controlling a computer entirely by voice is kind of absurd. "Open Browser! Open Gizmodo! Post withering comment about Apple tablet story, with these words!" No. Not now, and really, not ever—the computer as a stenographer is an obnoxious concept, held back by practical concerns, not technological ones. That said, Apple is very proud of Voice Control on the iPhone, and they haven't removed voice commands from OS X in over five years. It's likely that there will be some kind of voice input for the tablet, but that it'll be relegated to the same job it's held in the past, taking care of the odd command and initiating the occasional script, and not much else. Styli! The very thing the iPhone was so dedicated to murdering could be the savior of the Apple tablet! Just ask Microsoft. Oh, a stylus, right? We're going to use a stylus. No. Who wants a stylus? You have to get ‘em and put ‘em away, and you lose ‘em. Yuck. Nobody wants a stylus. So let's not use a stylus. We're going to use the best pointing device in the world. We're going to use a pointing device that we're all born with - born with ten of them. We're going to use our fingers. We're going to touch this with our fingers. This wasn't a dismissal of styli. This was a dickish, public obsoleting of styli. If I were a stylus, I would refuse to work with Steve Jobs, on the basis of him being a jerk. Upon the occurrence of an ink phrase termination event, the ink manager notifies the handwriting recognition engine and organizes the preceding ink strokes into an ink phrase data structure...The present invention, in large part, relates to the observation that client applications and handwriting recognition software in pen-based computer systems can make far more accurate ink-related decisions based on entire ink phrases, rather than individual ink strokes. If not, you'll have to take my word for it: This is basically the Newton's Rosetta, updated for 2009. Stylus input would be a stunning break from Apple's iPod/iPhone finger-only strategy, and to a lot of people it would seem regressive. Then again, if the tablet is a perfectly predictable extension of the iPhone concept, it won't revolutionize anything at all. I'm still filing this under "unlikely," but looking at the evidence, I honestly—and surprisingly—can't rule it out. The safest bet for how Apple will handle the text input problem is not coincidentally the broadest. Any onscreen keyboard would have to be different than the iPhone's somehow, but to say that Apple's tablet will have a new style of keyboard is to say that it will have pretty much any kind of onscreen keyboard that is unlike the iPhone's. This is not very useful! Luckily, we have guidance, from other companies, and even from Apple. Split onscreen keyboards are neither new nor common, which makes them kind of perfect: the map has been charted, so Apple needs only to explore it. The most public of the alternatives is an actual, available product called DialKeys. Coopted by Microsoft a few years ago, this tech, which splits the keyboard into two crescent-shaped virtual keyboards, shipped with a handful of touchscreen UMPCs, a category of devices that died off before it had the time to truly solve the onscreen keyboard problem. It wasn't very good. But the concept had potential, maybe. Apple is definitely aware of DialKeys, even if they can't use it—not that we'd want them to, or that they need to, having acquired a company with a similar concept about five years ago. The MacNTouch Gesture Keyboard is a complete user interface that serves as mouse, standard keyboard, and powerful multi-finger gesture interpreter. Mouse operations like point, click, drag, scroll, and zoom are combined seamlessly with touch-typing and multi-finger gesture everywhere on the MacNTouch's surface. Proprietary hardware and software allows pointing right over the keys, thus eliminating the frequent movement of the hand between the keyboard and the touchpad. The MacNTouch has been designed to minimize stress and it gives users unprecedented control of their computer using hand gestures. Obviously such a product relates to a lot of aspects of tablet input, so let's zero in on text: it's exactly what the tablet needs, basically, except it's not software. The keyboard is split for possible thumb use, it's capable of gestures, and most importantly, it's already owned by Apple. Best of all, the FingerWorks domain, which proudly displays all of these concepts, was pulled from the internet this week. If this feels like a strange coincidence, that's because, well, it is. For all the evidence about the tablet's possible input methods, there's no standout answer. Apple's got a thing for voice input, a history with onscreen keyboards, a patent trail and strong lineage of stylus input, and a pattern of suspicious behavior with and towards new keyboard types. We've got a handful of cases here, all compelling, and all conflicting. And the takeaway, if you haven't picked it up yet, is that nobody really knows. For my money, though, an adapted, possibly split onscreen keyboard is the best bet, and assuming the learning curve isn't too steep, the most appealing option. But of the options laid out here, it's by far the most vague—its FingerWorks ancestor is nearly a decade old, conceived in a time before multitouch screens—so the only truly safe bet is that whatever Apple comes up with, it's going to surprise us.